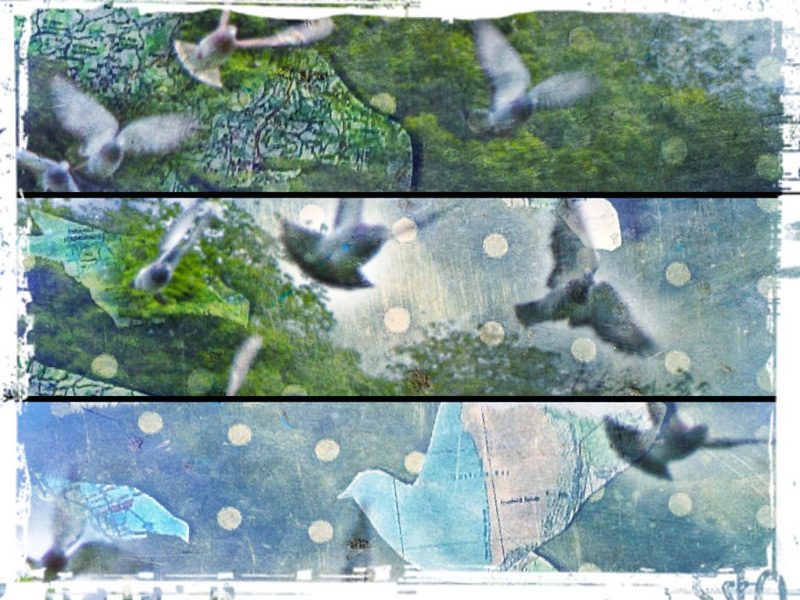 A layering of photographic fragments of homing pigeons being released and pigeons cut out from ordnance survey maps, the idea of getting one’s bearings being a momentary thing that we do constantly at a subconscious level. These maps are of places I traveled to with my partner of thirty years. Anna Dickie started writing poetry in her late forties and has been published widely. Her first pamphlet Heart Notes was published by Calder Wood Press, and last autumn Imprint, a collaboration with fellow poet Irene Brown, was published by jaggnath press. Her poem “Snow” has been anthologised in Not Only the Dark, a book in aid of Shelterbox, a charity providing worldwide disaster relief, and she recently took part in BBC Radio 4’s Poetry Workshop with the poet, writer and broadcaster Ruth Padel. She also performs with a poetry group called Poetrio. These are beautiful, like corners of a stained glass window. Lovely combinations…the maps, the birds, the partnership. I love the layers. Anna, you have combine lovely elements here – visually and emotionally. This is just beautiful! A fine tribute to your inspiration.